He Bought The Cheapest Bentley Continental GT In The US! - Muscle Cars Zone! He Bought The Cheapest Bentley Continental GT In The US! There is an ever-lasting dilemma people always have in their minds when purchasing a new car, that being whether you should buy a well-known luxurious brand car that is considerably older or buy some car that is new for around the same price. 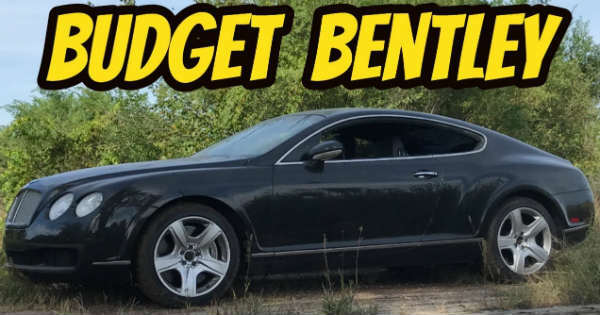 Even though this might be different form car to car, we hereby present you the cheapest Bentley Continental GT and why you should avoid buying it. This luxurious car was very expensive to buy when it first came out but price has ridiculously lowered over the course of these couple of years. You can now get one for a cheap price of just somewhere around $27,000. This host from Hoovies Garage takes us through some of the aspects that are good and that are bad about this car that he got it an auction. The first thing that he liked about the car is that it only has 45,000 original miles on it which is surprisingly low for such car. The interior and the exterior of the Bentley Continental GT were in good condition and the car was never involved in a serious accident. But there is one big flaw about this car. It has been previously shipped somewhere in Finland and then was sold to Russia. The Russian owner then sold the car yet again in the US for a surprisingly low price. We might suspect that something fishy has been going on. Take a look at the whole video and see the exact reasons why you should never buy such cheap Bentley!